The b&b is situated in one of the historical neighbourhoods of Rome, Quadraro, close to important Archeological site of Appia Antica. The b&b offers good transport links into the City and it is located next to the tube station Porta Furba Quadraro, only five stops away from San Giovanni and Mura Aureliane which encompass the city centre area; 10 minutes from Termini central station and with quick links from and to Ciampino and Fiumicino Airports. Martini Bed is a delightful and comfortable home-style loding that the two brothers Henry and Paul Martini make available to those who love to travel, alone or in company, and want to know the history and traditions of their beloved city, Rome. The Bed & Breakfast can give hospitality up to 6 persons. There are two rooms with private bathroom for rent, one is a twin/double and the other is a 4 bedroom with a bunkbed and a double bed. The rooms are recently renovated and well furnished: private bathroom, tv (italian tv), speakers for music player, hair-dryer, Wi-Fi internet connection. 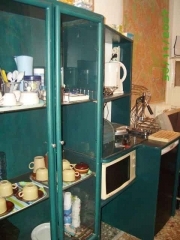 The common rooms are well furnished: free use of internet pc, smokers corner, fridge, microwave oven, american/italian coffe makers, kettle, toaster, pop-corn maker. Get the train from the airport direction FARA SABINA/ORTE and get off at Tuscolana Station. Leave the Square Station through Gela Street (via Gela), go straight ahead and get the tube (Line A) at Pontelungo Station direction Anagnina. Get off at Porta Furba Quadraro tube station, and follow "via dei Fulvi numeri dispari" direction, go straight ahead and find number 67, then ring Martini P. on the left column of entry phone. Go to the building on the left and ring again, i'm at the third floor. Get the tube line A Anagnina direction, get off at Porta Furba Quadraro tube station, and follow "via dei Fulvi numeri dispari" direction, go straight ahead and find number 67, then ring Martini P. on the left column of entry phone. Go to the building on the left and ring again, i'm at the third floor. Get a cab (EUR 15/25) or take the bus for Anagnina (EUR 1) and then take the tube. Get off at Porta Furba Quadraro tube station, and follow "via dei Fulvi numeri dispari" direction, go straight ahead and find number 67, then ring Martini P. on the left column of entry phone. Go to the building on the left and ring again, i'm at the third floor. then take the second on the right (via Opita Oppio) and take the second on the right once again and stop there my apartment's gate is next to the shop "latticini Francia".